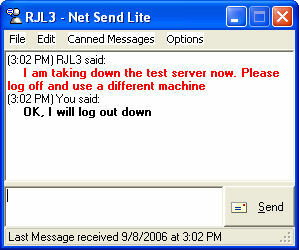 This is the main screen of Net Send Lite where you can select use the username, computername, ip address or domain/workgroup to send the message to. Double-clicking on a user will bring up the net send chat window to send them a message. The Add button drops down to include an "Add Multiple" option, which allows you to quickly add multiple net send users. 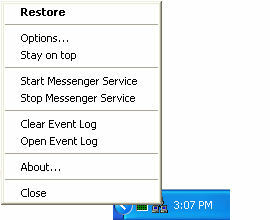 The Options drop down button include several features like "Clear Event Log", "Start Messenger Service" and more. 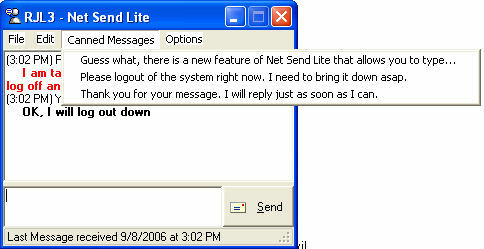 This is an example of a standard Net Send message that would be displayed via Microsoft's Messaging Service if the recipient of the message was not running our Net Send Lite software. This is the same message, however when Net Send Lite is running. If you Net Send the same person back and forth, you get a nice chat window that displays the messages that were received and the outgoing messages you have sent. 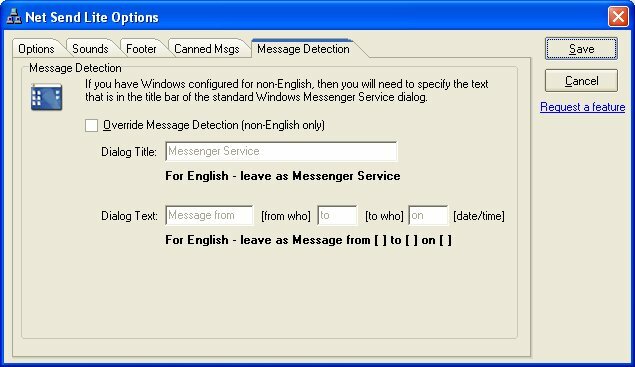 This is done by capturing the standard Net Send message window and displaying it in our own chat session. 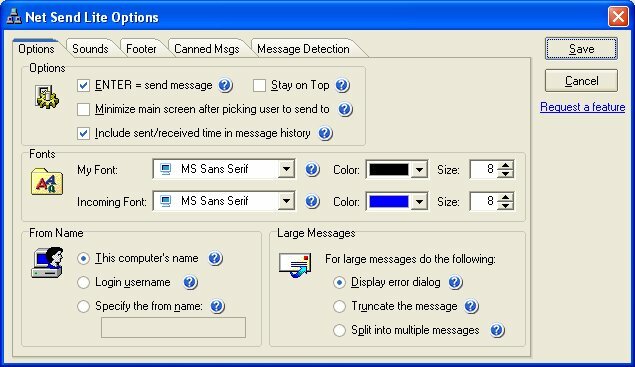 You have the option to Save, Print and clear the message history. 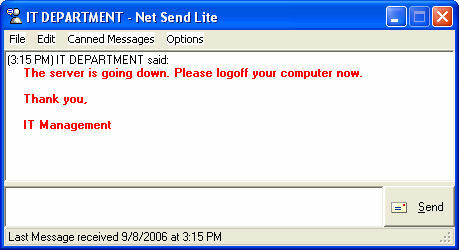 Inside of this Net Send Lite chat message session, if URL's are sent, you can simply click on the URL from within the message. This is the same for UNC drive paths. Look below. This shows the chat screen when you have selected to use the Canned Message feature. A small drop down will appear in the menu and on right-click of the message. From this drop down you can quickly select the message text you want to send and it will automatically populate the message into the box for you. From the main screen you can select the Add Multiple dropwon under the Add button you will be brought to a screen like the one below. You can CTRL-Click to add the users to the net send main window. This will locate computers across your primary domain. You can create a shortcut for your entire domain like below. 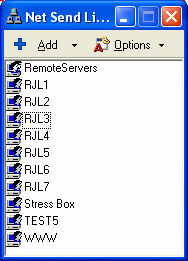 This would be setup to send net send messages to everyone logged in to the RJL_LAN domain. Using the Display Name of "Entire Domain" you won't have to try and remember what was the windows domain you want to send to. You can create a shortcut for specific groups of users. In the example below we have created a group that will allow us to send net send message to our remote developers IP Addresses. As you can see from the screenshot below, each IP Address is separated by the : (colon) character. In the example below we have created a group that will allow us to send net send message to the entire Net Send development team using their windows login names. As you can see from the screenshot, each user is separated by the : (colon) character. Of course you can still send messages to one logged in username, computername or ip address. 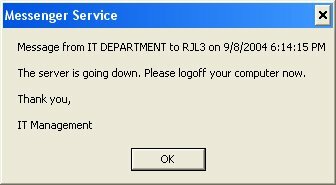 Below displays an example of sending a message to Bill who logs in to Windows on the RJL4 machine. We have setup a display name of 'Bill' so it is easier to read and send messages to him. There are some options you can configure within Net Send Lite . You can set the ENTER key to trigger the sending of a message. This is very handy when wanting to quickly send messages to users. The font options change how the chat window's preferences look. The From Name option allows you to set who the message is coming from. This is very handy because by default Windows uses the computername or IP Address as the From when sending out messages. This option allows you to use your username or any name you want (as seen in the screenshot below). 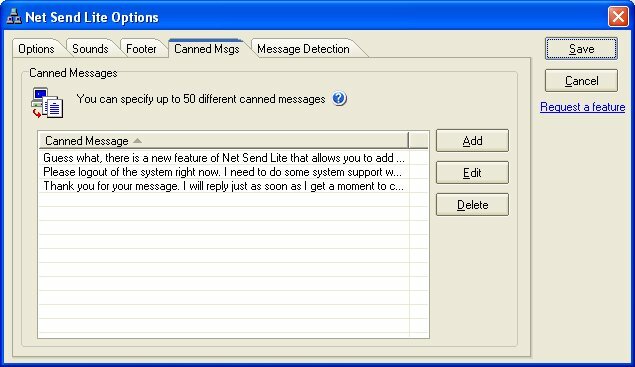 Net Send Lite allows you to send large messages to users, you have the option to prevent the message, truncate the message or split the message until multiple messages. The Footer option with Net Send Lite lets you to set an automatic footer that is sent out with each message. 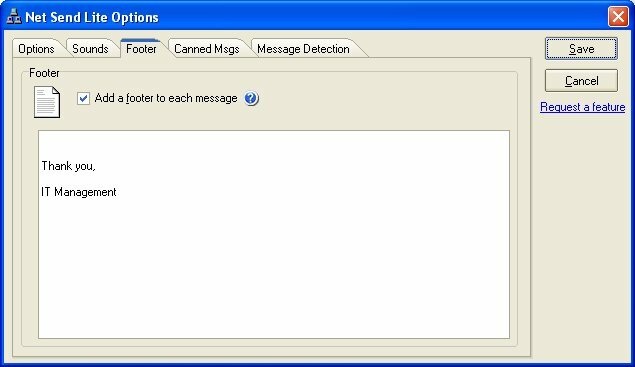 Canned Messages allows you to set a list of frequently sent messages. After setting these you will see a small drop down box on the main screen where you can quickly select the message you want to send. Message Detection is a way for you to specify how Net Send Lite captures net send data from the Messenger service in Windows. Set this only for Internationalization, if you are running Windows in a non-English mode. Net Send Lite is a tray icon utility that will sit in your system tray. 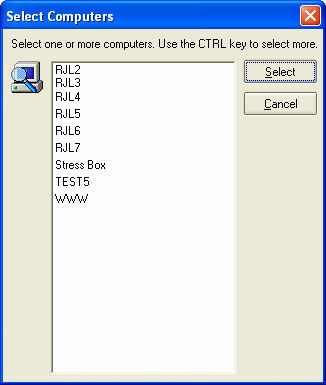 This is the menu you will get when you right-click on the Net Send Lite icon in the system tray. This include a Stay On Top option that allows our product to stay on top of all other windows.